This entry was posted on March 23, 2009 at 8:30 pm. In church of Christ circles Edward Fudge is both despised and loved but one thing everyone, including those outside of churches of Christ, can agree on is Edward’s consistant, life long habit of putting the focus of his message and ministry on Jesus Christ our Lord. I became acquanted with Edward Fudge upon the recommendation of a friend who disagreed with some of my teaching but did so in a loving way. He thought I would enjoy Bro’ Fudge’s gracEmail and he was right about that. Over the past few years I have solicited his opinion, asked him to critique some of my study and conclusions, and have found in him a kindred spirit who is full of grace and love for all who love Jesus. 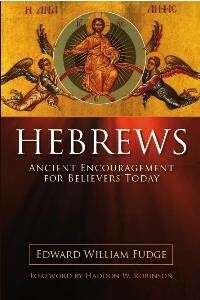 When Edward asked me to review his latest book, HEBREWS, Ancient Encouragement for Believers Today I was delighted to do so. This great work comes highly recommended and rightly so. It is a verse by verse commentary on the book of Hebrews. Edward Fudge, always a scholar, has obviously done his work well documenting back ground work, original languages, several translations of Scripture, and acknowledging other authors ideas. But the finished product is as readable as the morning paper. Every pastor/teacher and every person in the pew or behind a podium will want this wonderful resource at arms length when the book of Hebrews is explored and studied. I especially appreciate the frankness and fairness exhibited throughout the book. In dealing with those passages in Hebrews which have been historically the most controversial and in some cases the most difficult to understand, Fudge has given not only his conclusions but also a very balanced and fair presentation of the most prominent conclusions as well. Unlike many of his peers, Fudge trusts his readers to read and make their own conclusions. This almost unique treatment I really appreciate. The whole of the volume is rich and encouraging and well worth reading and sharing, but one thing stands out clearly. Jesus is better! He is better than the angels, better than the Levitical Priesthood, better than the animal sacrifices, and His once for all people, once for all time offering of His own body for sinners is quite enough to satisfy completely our Holy Father. There is no reconciliation without representation. Just as Adam was our representative head and we died when he died, Jesus is now our representative and we died when He died, and rose when He rose, and live because He lives. And, as Edward Fudge beautifully writes, we now have a man (God/man) in heaven who continues to represent us until He comes again to complete our salvation. Many thanks brother Fudge for the gift of your love and labor. May it bring glory to Christ our Lord.